Normally the presence of water makes things rusty. For me, quite the opposite is true. It’s been a while since I’ve been able to get out with the camera in any serious way and I really felt it this last weekend. I was surprised that it took me one session to get back into a rhythm. I sometimes feel like this even when I have been shooting regularly – the first 15 – 20 minutes are essentially me stretching and warming-up so that I can work towards the image that I have in mind. If anyone has good ideas for a series of ‘stretches’ to make that first few moments on location more productive I’d be happy to hear them. Fortunately the weather held out while I was at the beach which meant that I was able to get a few sessions in and came away with at least one image I was happy with. 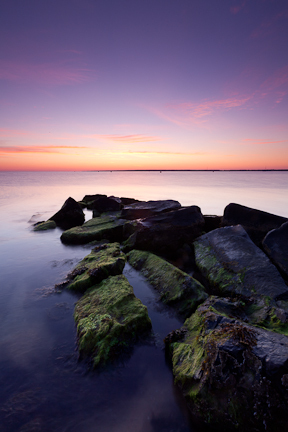 This entry was posted in Photo of the Week and tagged Beach, Coast, Glacial Erratics, Motion, Rocks by nixonphoto. Bookmark the permalink. Thanks Alex! I very much appreciate the encouragement. I’m going to be working on getting the link up for print sales this weekend. The prints will be hand-crafted! Yup – printed and matted myself. I enjoy the printing as much as, or more, than taking the photographs!